Objective: Marycin is a porphyrin-type compound synthetically modified to spontaneously release fluorescence. This study is aimed at understanding possible mechanisms that could account for the antiproliferative effects observed in marycin. A proteomic approach was used to identify molecular effects. The proteome of proliferating MDA-MB-231 breast cancer cells was compared with that of marycin-treated cells. Methods: Label-free proteomic analysis by liquid chromatography coupled with tandem mass spectrometry (LC-MS/MS) was used to reveal changes in protein expression and fluorescence microscopy and flow cytometry were used to detect subcellular organelle dysfunctions. Results: The bioinformatic analysis indicated an enhancement of the expression of proteins remodeling RNA splicing and more in general, of RNA metabolism. Marycin did not localize into the mitochondria and did not produce a dramatic increase of ROS levels in MDA-MB-231 cells. Marycin stained organelles probably peroxisomes. Conclusions: The results could support the possibility that the peroxisomes are involved in cell response to marycin. 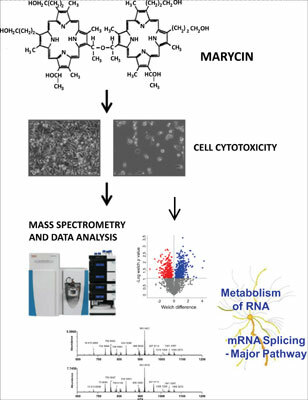 Marycin, porphyrin, anti-proliferative effect, RNA metabolism, RNA splicing, peroxisomes, MDA-MB-231 breast cancer cells, LC-MS/MS.